Carrabba's Italian Grill provided dinner and transportation in exchange for this post. As always, all opinions are my own. Starting at age 23, every Wednesday my friends and I would go to Carrabba's for Girls Night Out. Present day, we try to go there whenever I am home visiting. Every year for Christmas, we have an annual Girls Christmas Dinner at Carrabba's. This has been a 10+ year long tradition. To say Carrabba's has a special place in my heart is an understatement. Prior to working there, I was such a picky eater. Working with so many people in the restaurant industry grew my palate. I also got my first learning of wine while working there (in FL, you can serve alcohol if you are 18+). While in town for the holiday's, my friends and I met up at Carrabba's for our annual Girls Night Out Christmas Dinner. We strategically planned for this evening to be on a Wednesday night so we could take advantage of Carrabba's #WineWednesday, saving us $10 off of every bottle of wine. They have a really nice wine selection and we ended up going with a delicious bottle of Folie a Deux Cabernet Sauvignon from Alexander Valley, thanks to a suggestion from our server Troy. With the $10 off, this bottle cost us a little over $30 a bottle. Can't beat that! 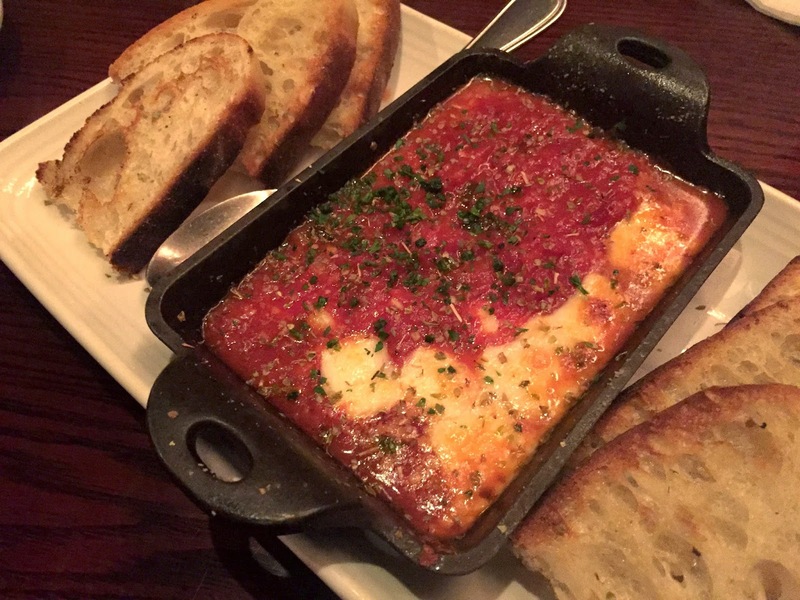 We began the night with two appetizers - the first was Brick-Oven Baked Fontina Bruchette - Brick oven baked fontina and marinara served bubbling in a hot cast iron dish with oven-baked ciabatta bread. This starter was so good - it did not last long. The second appetizer we had was a Meatball and Ricotta Flatbread - a crisp flatbreat topped with housemade meatballs, ricotta, mozzarella and romano cheese. I think we all have a new obsession at Carrabba's and I see myself ordering this on our next girls night out! Then this happened......thanks Troy for the amazing wine selection! Apparently, we LOVED it! We also didn't have to drive home thanks to UBER picking us up, so we had a little more fun than normal. Back to the entree's. Keri, Tara and Darlynn all ordered a version of sirloin marsala, so I will not bore you with three nearly identical photos. Keri decided on the Sirloin Marasala Spiedino. This is a tried and true dish at Carrabba's for us, one we typically share on our Girls Night Out. We did learn about Carrabba's Marsala sauce on this trip. Their Lombardo Marsala comes from Italy and is specially bottled for Carrabba's. I have tried to copycat this at home multiple times and it never turns out as good. Now we know why! I need to get my hands on a bottle of that Lombardo Wine! I made up my own entree - a Filet Fiorentina with Lobster Ravioli as my side dish. This was the exact meal Gabe and I had on our first date at Carrabba's nearly 5 years ago in January. On our first date, I had the filet, a 9oz USDA Choice center-cut wood-grilled tenderloin and Gabe had the Lobster Ravioli in a white wine cream sauce. So I combined our two first date meals into one amazing meal. At this point, the 5 of us could have literally been rolled out in a wheel barrow. However, that didn't stop the desserts from coming out. While I am not a huge chocolate fan, Carrabba's Sogno di Cioccolata "Chocolate Dream", a rich fudge brownie with chocolate mousse, fresh whipped cream and housemade chocolate sauce, holds a special place as I ate this on a daily basis while working at Carrabba's. Luckily for me, I had a wicked metabolism at 18. If you've never tried it, I suggest a trip to Carrabba's stat. We also got the John Cole, Vanilla ice cream with caramel sauce and roasted cinnamon rum pecans along with Tiramisu, Lady fingers dipped in liqueur laced espresso, layered with sweetened mascarpone, Myer's Rum and chocolate shavings. Luckily, I ran 6 miles earlier that day. I couldn't have asked for a better Girls Night Out on #WineWednesday at Carrabba's. It was great catching up with my friends from back home, in a restaurant that holds so many precious memories. 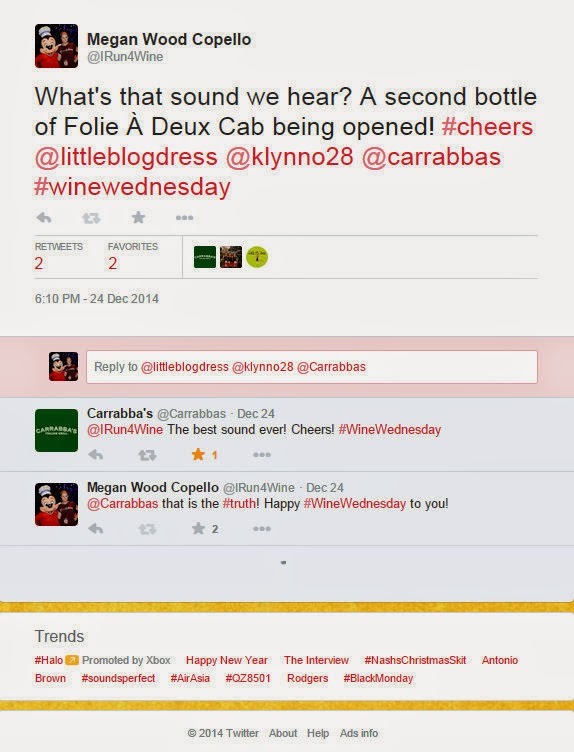 I am giving away a #WineWednesday experience for 2 people (up to $50) to any Carrabba's in the US. Let me know in a comment below who you would take on a #WineWednesday night out and why. Make sure you log your entries in the Rafflecopter widget below. If you don't see it at first, refresh the page. Good luck! Probably my hubby. Carrabba's is our favorite and I love that they have a gluten free menu! I would take my husband so we could have a date night. I would take my hubby one date! I'd take someone special! Date night! I would give the gift certificate to my boss so she and her husband can go out for a nice dinner. She is always so good to me and I would like to do something nice for her. Best boss in the world!! I would take my mom and sister if I won. I would take my husband and my oldest daughter who is 22 to Carrabbss if I won. I would take my girlfriend.. she loves her wine! we've never been to Carrabbas! I'd take my sister out, we don't get to spend nearly enough time together! I would go on a date night with my husband. I would go with my husband just because we need a night out. I would take my husband because we always have fun on our dates.